For the last year I have been busy getting adjusted to a beautiful new familiy member: a son called Boris. This big change in our lives has been the main reason that I don’t have, or make, enough time to regularly post on my blog. Also, I have been DJ-ing a lot less because I’m getting up earlier than I used to and I’d like to get some sleep before going to my day job. But of course I have been expanding my vinyl collection, drinking espresso (a lot!) and tinkering with my bikes. 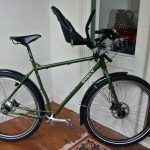 And since I will be biking with an extra passenger for the next few years I thought I would build an extra bike that can be outfitted with a child bike seat. We already bought a Yepp mini for my girlfriend’s bike that can be used with an optional A-head adapter. 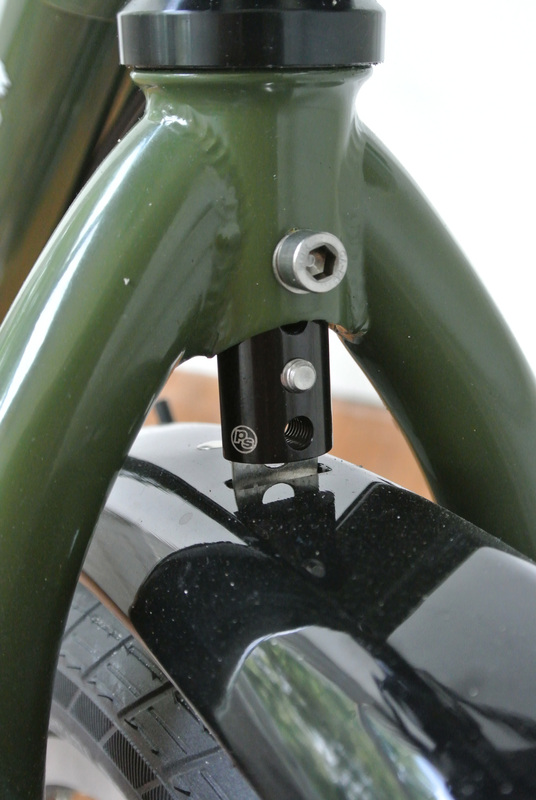 The adapter is mounted between the spacers and secured with a clamp over the stem. 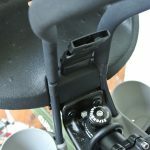 It works great and you can take off the seat with a button on the underside of the seat, leaving just the adapter on the bike. 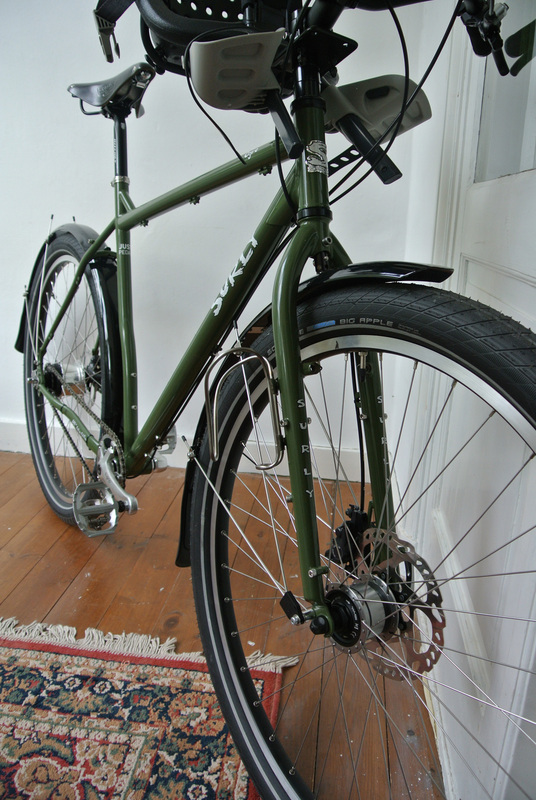 Second was deciding which frame: I wanted big tires and fenders, rack mounts, the possibility of using disk brakes and I wanted an Internal Gear Hub (IGH) because of low maintenance. There aren’t that many frames that tick all these boxes so after some research I opted for a Surly Ogre (link) frame that I ordered from Jelle at JustPedal.nl. 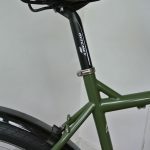 The Ogre is a steel frame with everything you could ask for, including eyelets for racks and fenders, bottle mounts on the fork and under the downtube and you can also use it in singlespeed modus or with a derailleur. After choosing for the classy green color it was time to look for some wheels. 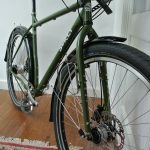 This bike is mainly going to be used on the road, with maybe an occasional gravel path, so I didn’t see the need for a lot of gears. Choosing between an 8 or 11 speed was quite easy with this in mind and since the asking price for an 11-speed is also much higher, I chose the cheaper 8-speed. 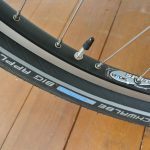 Because there were no off-the-shelf wheelsets available that included a Shimano Alfine rear hub and a dyno front hub, I contacted Marten Gerritsen of M-Gineering. Marten Gerritsen has made some nice wheels for me before and if you don’t mind waiting a few weeks, you are rewarded with beautiful wheels for a competitive price (coincidentally he had the Alfine 8 speed on sale). 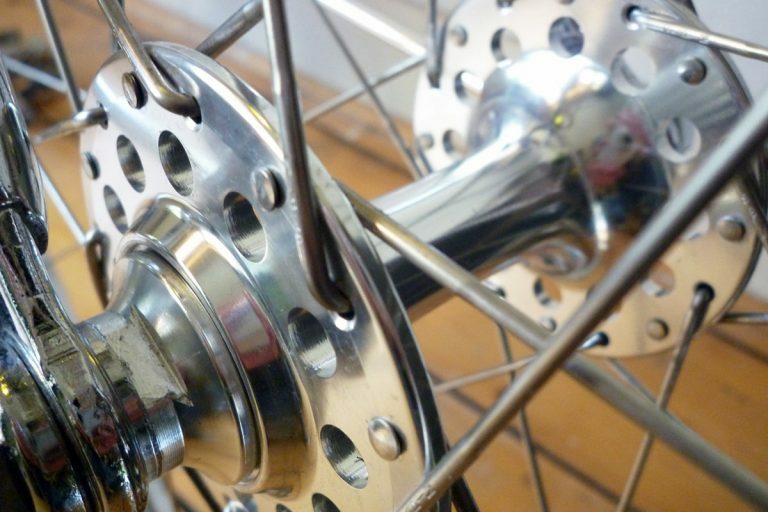 The wheels that arrived on my doorstep were built up using silver (Shimano dyno LX front & Alfine 8 rear) hubs, Ryde Sputnik rims and Sapim stainless steel spokes. 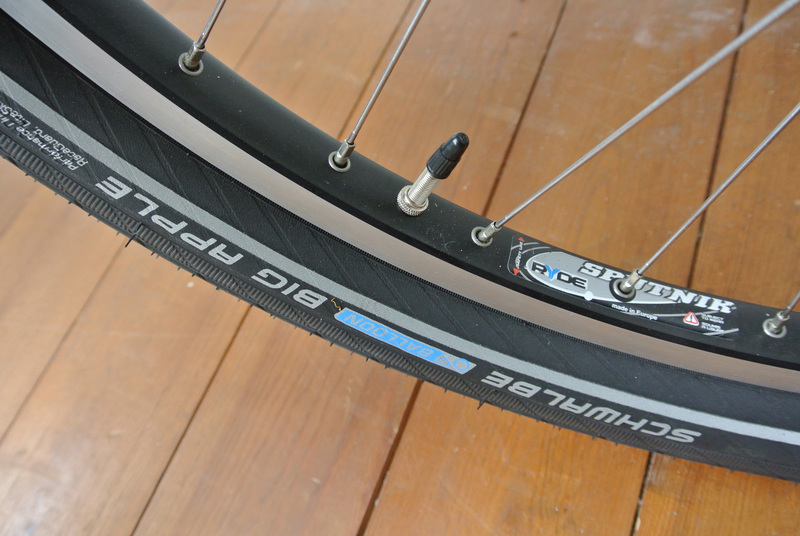 I chose the sputniks because they are a cheap alternative if you want to use rim brakes. 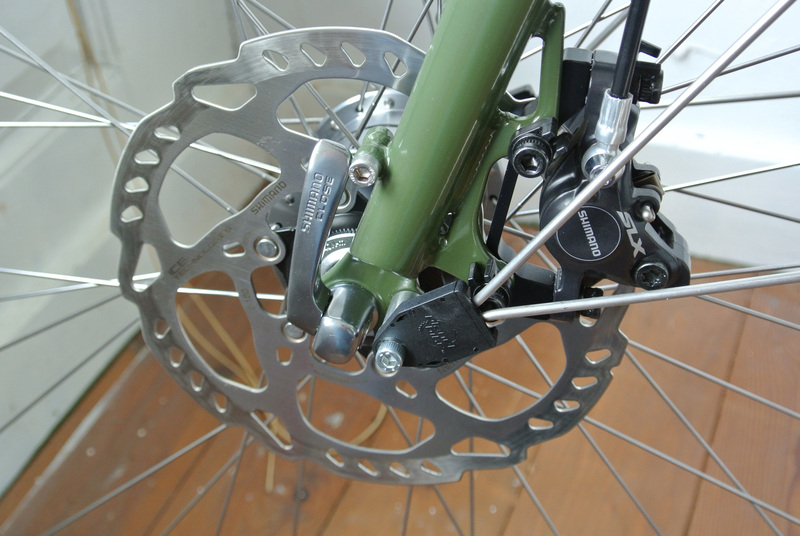 When I ordered them I was convinced I would use either v-brakes or cantilevers. 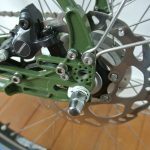 But while ordering and wating for all the components I gradually moved towards discs because the hubs are disc-compatible and because of the promise of better braking. 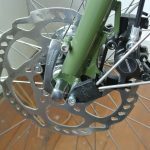 The first can be achieved by using a Nexus sprocket, these are dished and you can flip them outwards to get a chainline of 47 mm. That’s a lot better! I think you could use this with a mtb triple and use the middle ring (the Ogre has room for a 36T middle ring). 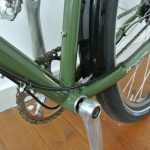 But, since I don’t believe in all the external bottom bracket hype and I keep hearing negative things about the short bearing life, I wanted to use a ‘traditional’ square tapered axle. This also gave me the possibility to find a combination that would move the crank a little bit inwards. 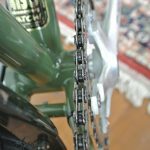 I settled for a combination of Sugino RD2 double road cranks with a 113mm Shimano bottom bracket and a Surly 40T chainring. When I mounted this combination I saw this wasn’t going to work, the chainring was hitting the chainstay, even with the use of a bb spacer of 1 mm. on the drive-side. So I exchanged the 40T for a 36T and now the chainring cleared the frame. But it still was very close, a clearance of about 2 mm is still a little small so in the end I replaced the 113mm BB with a 118mm and now it’s perfect. 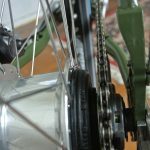 Chainline summary: Shimano Alfine 8 will give you a perfect chainline with a Nexus sprocket and a combination of a Shimano BB-UN55 118mm., Sugino RD2 double crankset and a 36T chainring when mounting the chainring on the inner position. 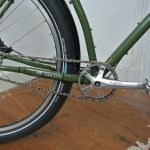 I’m still looking for a bashguard for the outer position, for both the looks and a little protection for the chainring. 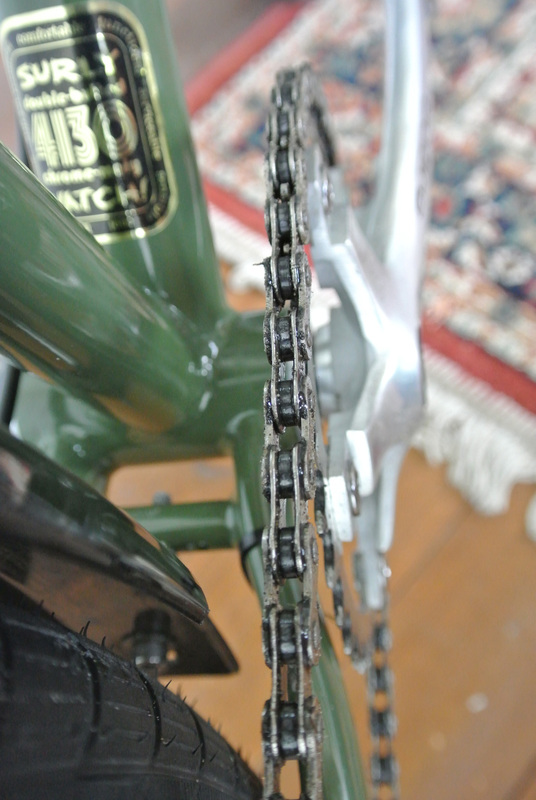 To get (and maintain) the correct chain tension I decided to use the Surly Tuggnut on the driveside, on the left I used the Shimano non-turn washer. 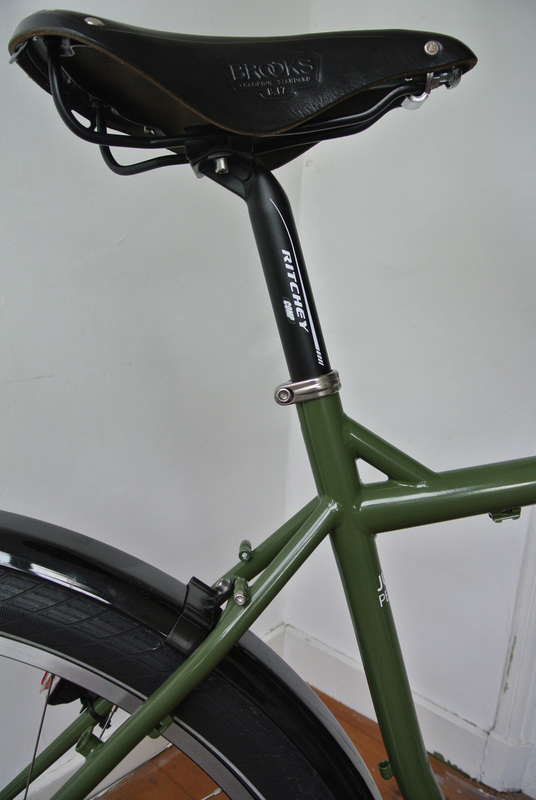 In this case this is the white one (6L) because of the track-style dropouts on the Ogre. Normally there is also a 6R washer that goes on the right side (hence the ‘R’) but it does not work with the Tuggnut. 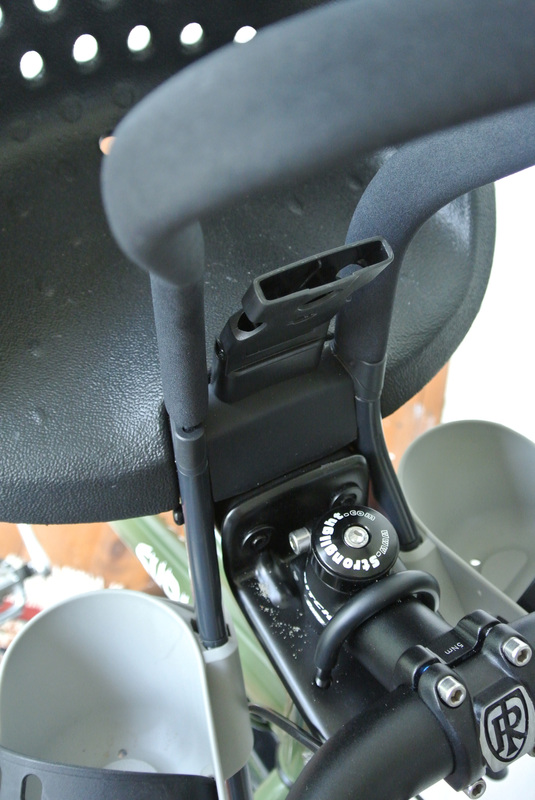 But the combination of Tuggnut and one washer on the left side seems to work well and I haven’t had any problems. 15-7-2014: I received an e-mail from Marten about the use of a single washer. According to him it is better for both the axle and the drop-outs to use both of them. In theory you could damage the drop-out in the lowest gear when applying a lot of power. So if you want to be sure, use both. For the handlebar I wanted something like a Jones H-bar, wide and with lots of backsweep. But since the Jones bars are expensive I went for a Soma Clarence, although l also could have bought a Jones Bend H-bar, it’s the same shape as the original H-bar but it’s a lot cheaper. 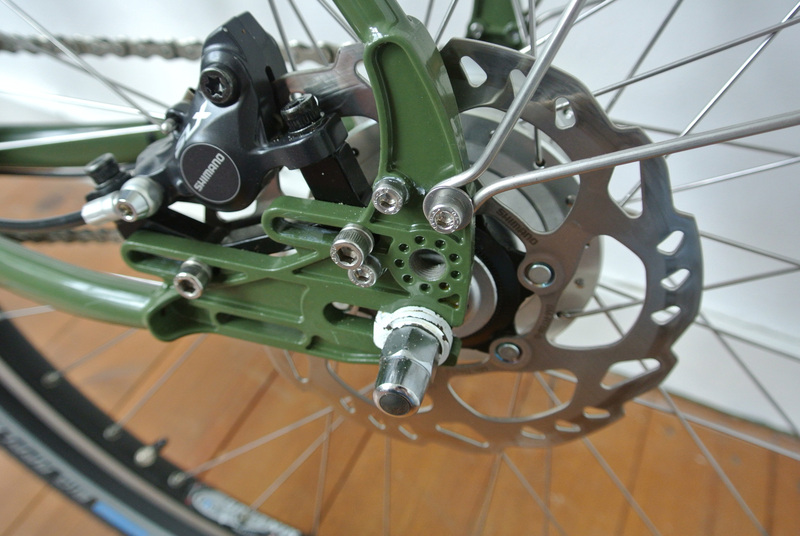 The disc brakes are Shimano SLX and the stem and seatpost something from Ritchey. Of course the saddle had to be a Brooks B17, since I have Brooks saddles on all my bikes, I already own a B17 and two Team Pro’s. 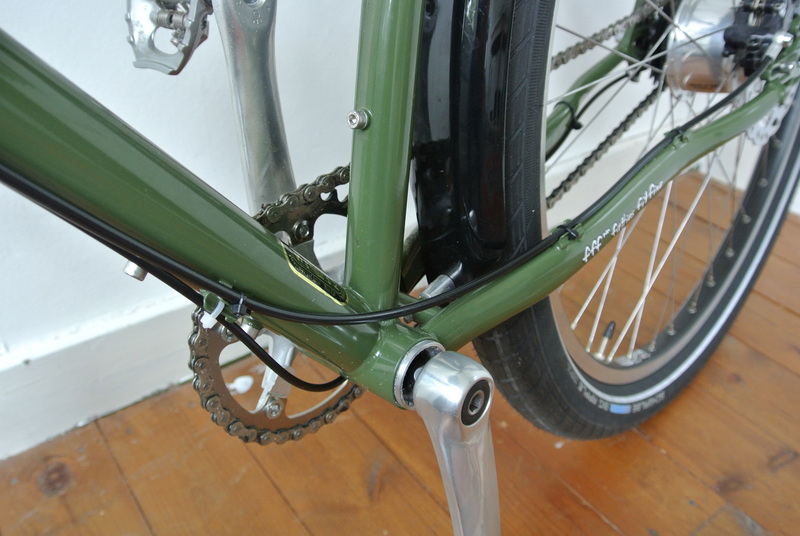 I routed the gear cable along the downtube and the chainstay. 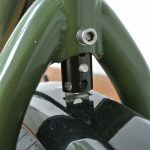 This gives the best clearance between cog/chain and the cable mount thingy on the hub. It also looks quite nice and it shifts very smooth. Adjusting the gears by aligning the yellow dots on the hub has to be repeated a lot during the first few days. And small increments seem to make a big difference. 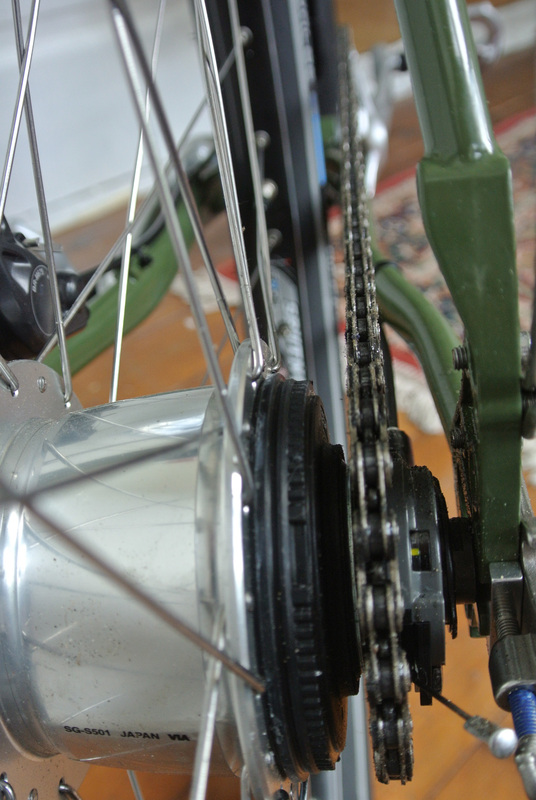 I felt something in my crank while pedalling that felt like play in either the bottom bracket or the hub. After replacing the bb and torqueing the hell out of it, I concluded it had to be something in the hub. After being grouchy for two days and disappointed about the hub, I noticed during cycling that the symptom had disappeared. I had readjusted the yellow dots so many times that I could not say for certain that it had gone because of the adjustment or because the hub had to break in. Because it rains quite often in Holland I wanted fenders. 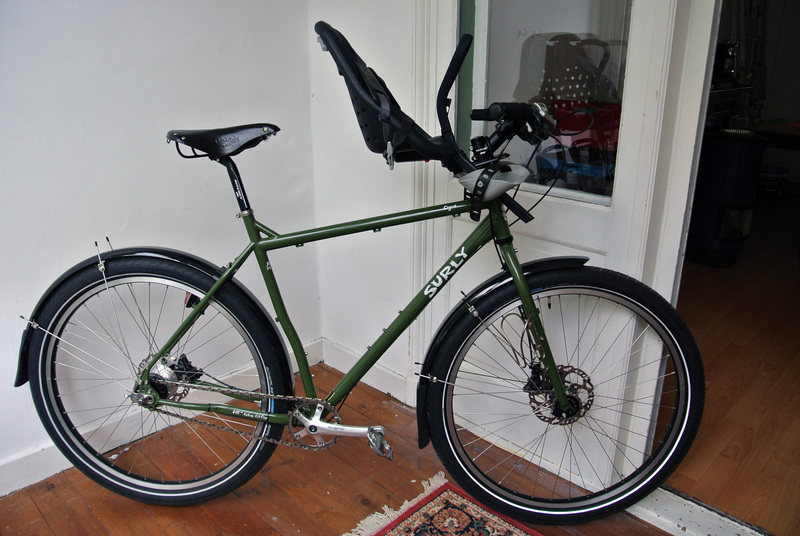 According to the Surly Blog the Cascadia 29″ fenders work well with the Ogre. 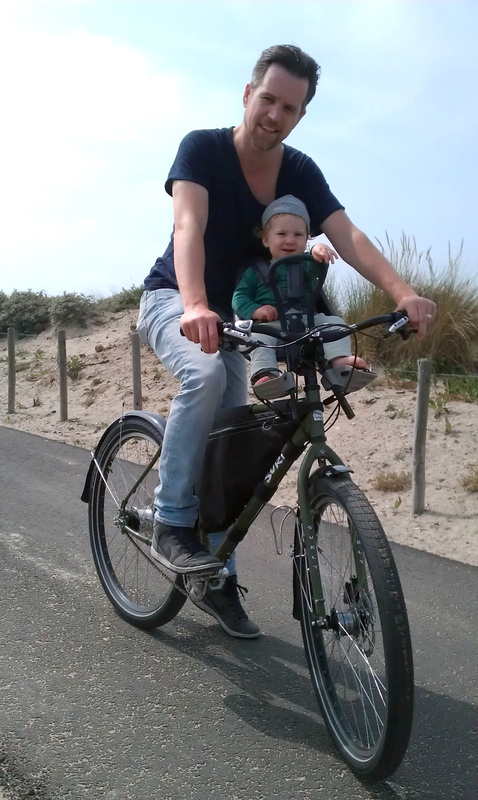 Fortunately, Jelle also had these fenders in stock, So I mounted them as instructed by Surly. But to get the fenders follow the wheel closely I used the Problem Solvers Fender Flute, this prevents a large gap between tire and fender so the fender works better and it also looks a lot better. On this bike I sit definitely more upright than on my other fixed gear and racing bikes. Which is a good thing because at lower speeds with a kid sitting in front, it’s nice to get some pressure off my arms and hands. But it’s not just for cruising or touring. When I take off the child seat, the bike is serious fun! It looks big and might be heavy but it’s definitely not slow or sluggish. It simply is a joy to ride and would recommend it to anyone who is looking for a fast and comfortable multi-purpose bike. Thanks for this infrmation! 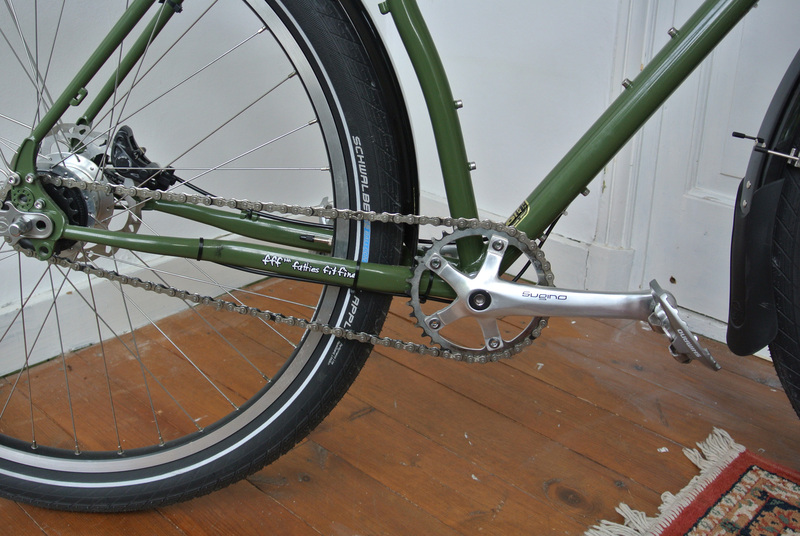 I am thinking of getting alfine 8 for my surly 1×1 and the chainline was a concern. This was very helpful! Thank you.